ROBERT TEN BROECK STEVENS was born in Fanwood, New Jersey, on 31 July 1899; was graduated from Phillips Andover, 1917; interrupted his education to serve as a second lieutenant of Field Artillery in World War I, 1918; graduated from Yale University, 1921; joined the textile firm of J. P. Stevens Company, 1921; married Dorothy Goodwin Whitney, 1923; was president of J. P. Stevens Company, 1929�1942; was an administrative representative in the industrial section of the National Recovery Administration, 1933; was Class B director of the Federal Reserve Bank of New York, 1934�1955, and Class C director and chairman, 1948�1953; attended a special civilian course at the Command and General Staff School, Fort Leavenworth, 1941; entered upon active duty with the Army as a lieutenant colonel, 1942, was promoted to colonel, and served to 1945 in the Office of the Quartermaster General�s procurement division, with a period of temporary duty in the European Theater; returned to J. P. Stevens Company as chairman of the board, 1945�1953; was chairman of the Business Advisory Council, U.S. Department of Commerce, 1951�1952; served as Secretary of the Army, 4 February 1953�21 July 1955; supervised the post-Korean War retrenchment; proposed advance security clearances for key industrial facilities to enable them to operate immediately in an emergency; defended the Army against reckless charges advanced by Senator Joseph R. McCarthy of Wisconsin in Congressional (Army-McCarthy) hearings held to investigate Communist influence in government, 1953�1954; returned to the J. P. Stevens Company as president, 1955�1959, and served as chairman of the executive committee, 1969�1974; died in Edison, New Jersey, on 31 January 1983. Thomas Edgar Stephens (1886�1966) was born in England and studied art at Cardiff University in Wales, the Heatherly School in London, and the Académie Julien in Paris. He was already a trained artist when he moved to the United States in 1929 to settle in New York and become an American citizen. 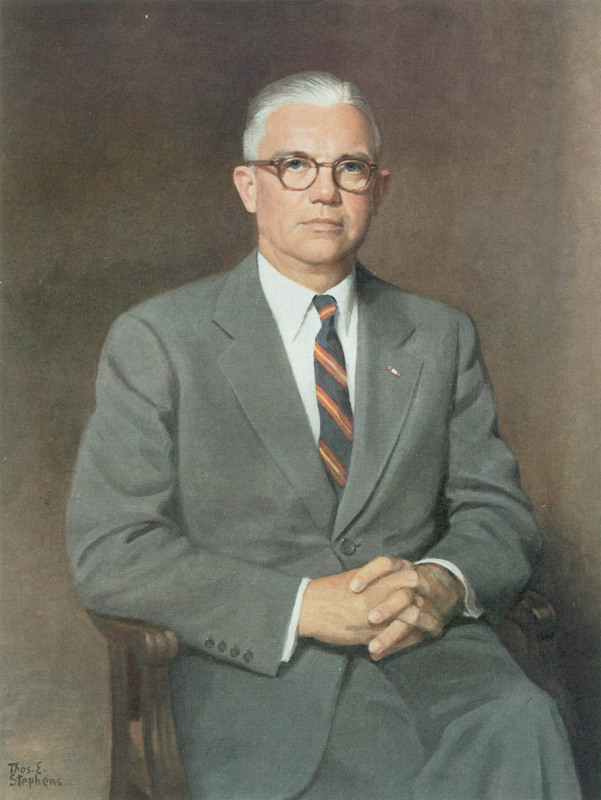 Between 1946 and 1960 he painted twenty-four portraits of Dwight D. Eisenhower for various institutions and individuals, and it was Stephens who painted the entire Eisenhower cabinet and later induced the former president to take up painting as a hobby. He also painted the last life portrait of Winston Churchill as prime minister.